Terry I LOVE these rag quilts. The colors are so much fun and festive! How CUTE! I think I like this style better than a traditional quilt! It's like the ruffles help blend the patterns together so there is not such a severe difference between them. Does that make sense? Oh Terry, this is so pretty! Hope you'll stop by and share at our Be Inspired party tomorrow! yay! i'm sooooo glad you went ahead and made it! It turned out soooo fabulous! well well done girlie! smooches to you! Love that blanket and the colors and flannel is just the softest. 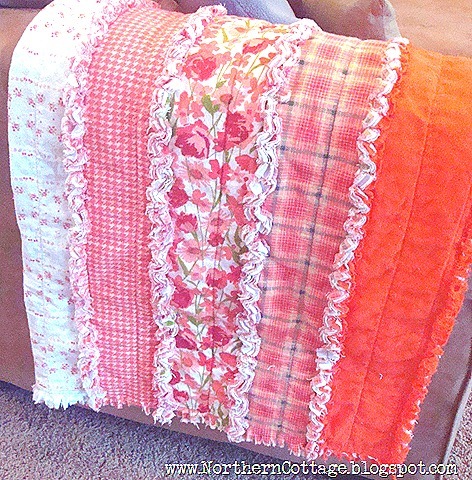 Your quilt turned out so cute, and I bet it is so snugly warm.....if you actually use it! Terry!! I LOVE THIS!!!! I'm soo going to make one for each of my daughters!! Love the rag rug, never made one, but now am thinking about it since yours is gorgeous. Looks snuggly and warm. Thanks for sharing your creative inspiration to Sunday's Best Par.tay!